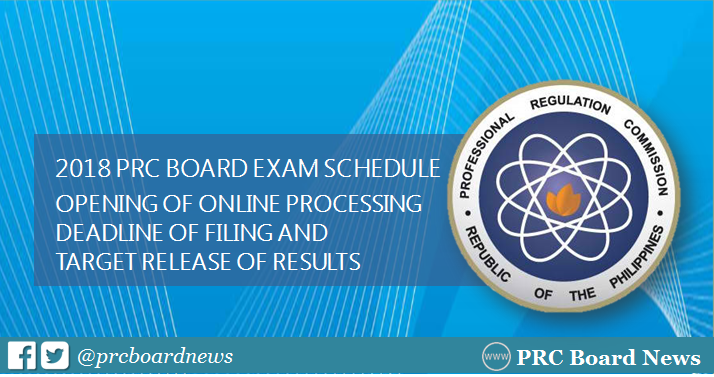 MANILA, Philippines - The Professional Regulation Commission (PRC) announces the schedule of board examinations for 2018. This includes the opening of online processing, deadline for filing applications, practical examinations, professional upgrading examinations, Special Professional Licensure Examinations (SPLE) and target dates of release of exam results. The schedule of exams in 2018 is pursuant to Section 7 (d) of R.A. 8981, authorizing the Commission to determine and fix the places and dates of examinations. It covers examinations for dentist, architect, mechanical engineers (ME), physician, medical technologist (medtech), professional teacher (LET), electronics engineers (ECE), midwive, electrical engineer (REE), certified public accountants (CPA), civil engineer (CE), nurse (NLE), criminologist, among others. The conduct of SPLE to Overseas Filipino Workers, shall be scheduled in accordance to PRC Resolution No. 2011-627 pursuant to R.A. No. 8981 and Executive Order No. 835. PRC advised that requests for additional testing centers outside the PRC Regional Offices for LET shall be in accordance with PRC Resolution No. 2012-675 series of 2012 dated August 24, 2012, "Designation of other cities outside PRC Regional Offices as additional testing center for LET." "The filing of application, together with the supporting documents, at the Central and Regional offices shall be in the period indicated in the schedule. Note that if the deadline of filing application falls on legal or regular holiday and non-working holidays, the deadline shall be on the immediately succeeding working day." this is nice post ..
kailan po ba sched exam sa RME.